Canadian Rockies Hiking by Yamnuska and Yamnuska Mountain Adventures are leading guide companies in the Canadian Rockies. In addition to backpacking and hiking programs we are known for our climbing and ski guiding and instruction. We have been in business since 1977 and operate year round. In summer, hiking, mountaineering, and rock climbing are the mainstay. Come winter and the focus switches to ice climbing, avalanche training and ski mountaineering. “Yamnuska” is the popular name for the mountain guarding the Bow River’s exit from the Rockies. This Stoney Indian word means ‘flat faced mountain’ and it is that ‘flat face’ looming above the Bow Valley that is famous for its many fine climbing routes. Past owner of Yamnuska Mountain Adventures, David grew up in New Zealand where he began a life-long commitment to mountaineering when he was 16. New Zealand’s Southern Alps were a perfect place to develop as a serious mountaineer. Upon graduation from University in 1975 he abandoned academia in favor of a mountain lifestyle. Between forays to climb in Europe and Alaska he also began working as a guide in New Zealand’s premier mountain region, Mt. Cook. After qualifying as an internationally certified mountain guide in 1983 David emigrated to Canada where a few short years later he found himself at the helm of Yamnuska which he then directed for 21 years. David continues his connection with Yamnuska and particularly enjoys guiding ski mountaineering and introducing beginners to backpacking and mountaineering in the summer. He especially appreciates seeing his clients discovering the mountains the way he did 30 years ago in New Zealand. He lives in Canmore with his wife Maria, also a guide. Adam grew up in Thunder Bay, spending most winter weekends at the amazing 225 metre local ski hill and in the summer trying to rock climb in running shoes at the local bluffs. He started his lifelong guiding career in Ontario as a sea kayak, white-water canoe and rock climbing guide, and has expanded his repertoire to include hiking, backpacking, ski touring, heli-skiing, via ferrata and mountain rescue. Adam has followed his passions around the world, bicycle touring in New Zealand, paddling the Northwest Territory’s South Nahanni River, thru-hiking the Appalachian and Pacific Crest Trails, sea kayaking in Belize, surfing and climbing volcanoes in Mexico, mountaineering in Alaska and climbing all over Canada and the US. 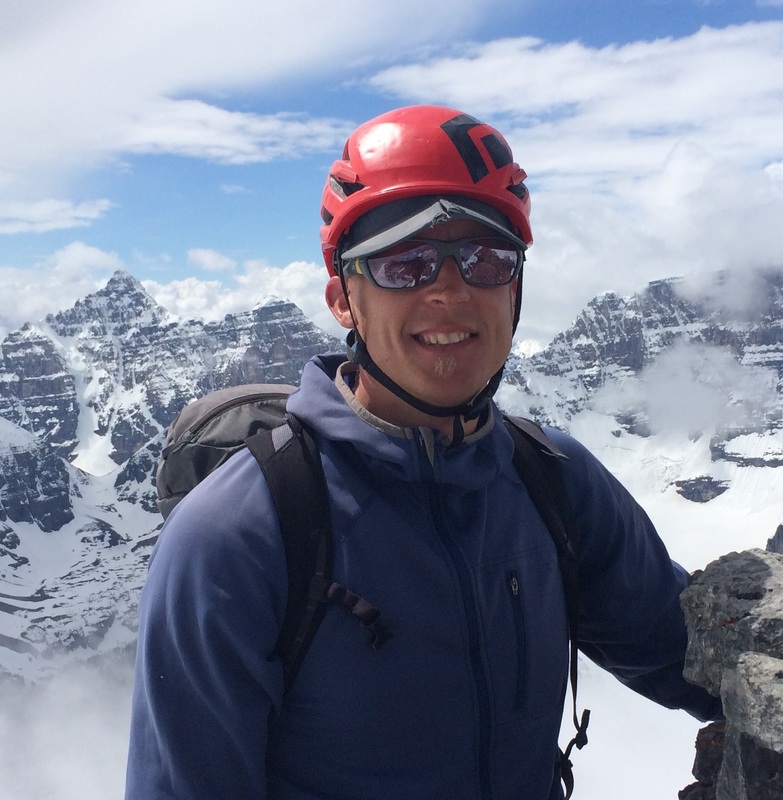 Adam has worked with Yamnuska since 2006, guiding and instructing ski touring, avalanche courses, rock climbing, hiking and backpacking for Yamnuska. He lives in Canmore with his wife Joanna and their two kids. Alison is originally from Northern Ireland, and after completing a degree in Geology from Glasgow University, she moved to Canada and has been involved in the guiding and ski industry ever since. She now lives in Canmore with her husband and 2 sons. In the winter season Alison is a ski guide and instructor then switches to backpacking and hiking in the summer. A committed mountain person, she enjoys rock climbing and mountaineering in her free time. Maria is a past owner of Yamnuska and she continues to work with Yamnuska overseeing and guiding on the hiking programs and working as a ski instructor. She originally hails from Newfoundland, but has resided in and near the Canadian Rockies since 1989 developing a strong love of the mountains and mountain activities. She has also worked as a geologist, cave guide, and interpretive guide for the Burgess Shale fossil beds in Yoho National Park. Maria’s passion for outdoor pursuits has taken her all over the world. In addition to hiking and backpacking these include cave exploration, backcountry skiing, ski mountaineering, climbing and geology. Maria’s extensive travels have reinforced that the Canadian Rockies are a wonderful backyard with world class hiking and backpacking. She truly enjoys spending time on the local hiking trails and sharing her extensive knowledge of the natural history and love of the mountains with her guests. Maria resides in Canmore with her husband David. Lisa works for Yamnuska both in the summer and winter on everything from avalanche courses, ski mountaineering weeks, to backpacking trips! While completing her Master’s of Science Degree at the University of Alberta, Lisa began Ski Patrolling and working as an Avalanche Forecaster at Mt. Norquay in Banff, AB. She then moved on to work with BC’s Ministry of Transportation and Infrastructure as an Avalanche Technician in the North Cascades. Over the last few years, Lisa has also worked her way through the Thompson Rivers University courses to become an ACMG certified Hiking and Ski Guide. Lisa also spends several weeks of the winter in the Cariboos working as a heli-ski guide. Lisa is a Professional Member of the Canadian Avalanche Association and a member of the CAA’s Complaint and Investigation Committee, and also chairs the ACMG’s Communication Committee. Lisa lives in Canmore, AB where you can find her skiing, biking, climbing, hiking. Her passion for the mountains is infectious, and she makes it her goal to share the joy the mountains bring with everyone. Lisa Is an ACMG Ski Guide, ACMG Hiking Guide and holds Level 2 certification with the Canadian Avalanche Association. Jane Whitney is one of our top hiking guides, and nobody knows the Canadian Rockies like Jane does. A seasoned wilderness leader, Jane has spent nearly two decades hiking the Rockies. Experienced in expedition travel, she has led several expeditions in the High Arctic, Patagonia and west coast Canada. She is also really fun to be with and has been lauded by many as a superb naturalist. Yamnuska Guides are supported by a skilled administration and logistics support staff who plan and book trips as well as organize meals, accommodation, transportation and equipment. Dave Stark has been instructing and guiding with Yamnuska since 1986. His climbing resume spans the globe with climbing and mountaineering experience on five continents. He has guided groups on high alpine peaks in Asia, South America, Antarctica and North America. As the Director of Operations at Yamnuska Mountain Adventures, Dave oversees the guides and all aspects of the programming. In addition to his supervisory and training duties he still actively guides and stays current with all technical facets of Mountain Guiding. He has written curriculum and evolved programs from ideas into full scale operations. He initially directed the Mountain Skills Semester at Yamnuska for over ten years. He has coordinated mountain safety crews and rigging staff on many film projects. He helped develop the curriculum for CAC Avalanche Skills Training Courses and has been teaching avalanche awareness courses for the past thirty years. Dave’s primary focus with Yamnuska, involves education, technical training, safety systems and assessment of risk. His specialty is providing maximum benefit in programming and skills learning. Dave is an IFMGA certified international Mountain Guide and holds Level 3 certification with the Canadian Avalanche Association. Jesse moved to the Bow Valley in 1998 to take part in Yamnuska’s three- month Mountain Skills Semester program. Using this as a springboard for his skills development, he has traveled all over the world to climb and ski and has pursued his passion. He now also acts as an examiner with the Canadian Mountain and Ski Guide Program to help others obtain their certification. Jesse is the Managing Director for Yamnuska and uses his skills both in the field and in the office to provide you with the best mountain experience possible. Some of Jesse’s personal mountain achievements have included: a 175km ski tour through the spine of the Canadian Rockies from Jasper to the Columbia Icefields, climbing the north face of Mt Temple, and climbing 5.12+ routes around the world. Some of Jesse’s favorite personal trips include: rock climbing in Thailand, Greece and Mexico, lodge-based ski touring in the Selkirk Mountains and ice climbing in the best ice climbing area on the planet… the Canadian Rockies! Jesse lives in Canmore with his wife Christine and 3 children. Paul is Yamnuska’s Program Director and a fully certified international mountain guide originally from the UK. He has been active in the outdoors for over 20 years, during which he has climbed and skied extensively in all corners of the Alps, as well as the Himalayas, Norway, North America, Canada and Alaska. For more than a decade Paul delivered and managed all aspects of climbing, mountaineering and back country ski courses for the British Armed Forces, which ranged from a variety of introductory programs to training and assessment courses at all levels. More recently Paul was the Director of Operations for the Tri Services Alpine Training Centre, but after living in the Alps for 5 years he decided to move to Canada. He instantly decided he wasn’t going back, although he has said he must return at some point to climb 2 more routes in order to complete the 6 classic north faces of the Alps. Sylvia graduated from our Mountain Skills Semester in 2002 and then, deciding to relocate to Canmore from Ontario, she joined the Yamnuska team. In 2005 Sylvia was promoted to the Office Manager, overseeing the accounting and finance and assisting with logistics and marketing projects. She is a keen rock climber and skier and competes in many running & cycling events, having recently taken up duathlons and triathlons. Sylvia is a certified nordic ski instructor with the Canadian Association of Nordic Ski Instructors. She now focuses primarily on marketing. Sylvia lives in Canmore with her husband Kevin and her twins Keira and Caden. Alix grew up in Toronto and moved to the Bow Valley after graduating from Thompson Rivers University’s Adventure Studies Program in British Columbia. Alix is an avid climber, skier and field artist. She also successfully completed her Top Rope Climbing Instructor certification with the Association of Canadian Mountain Guides in 2016. Maddy grew up climbing in Ontario and moved out west in 2014. She enjoys fly fishing, skiing, rock climbing and is currently working towards her pilot licence. Connor grew up in Calgary and spent his childhood weekends hiking in the front ranges. Strangely enough, he discovered climbing when he moved to Ontario for school. After returning West, he advanced to alpine climbing, ice climbing, and backcountry skiing. After a short 6-month stint of mountaineering in the Southern Alps of New Zealand, he returned to Canada and began working at Yamnuska. Connor is always striving to be a better climber and thoroughly enjoys everyday that is spent in the hills. Our backpacking and hiking guides are certified professionals. They are certified by the Association of Canadian Mountain Guides (ACMG) and the Interpretative Guides Association in addition to holding wilderness first aid certification. The very exacting standards to which Yamnuska’s guides are held should not obscure the fact that the guides are the heart and soul of the company. In addition to being great leaders, they are also great mountain companions. Yamnuska Mountain Adventures holds guiding permits for Banff, Glacier, Jasper, Kootenay and Yoho National Parks (403 762 1530 for verification). For Assiniboine and Bugaboo Provincial Parks in British Columbia (250 489 8540) and for Bow Valley and Peter Lougheed Provincial Parks in Alberta and also Kananaskis country also in Alberta (403 678 5508 for Alberta).